When one contemplates the list of breweries where heavy metal and craft beer overlap, the obvious options like 3 Floyds and Surly immediately come to mind. However, lesser known outfits like Burial in Asheville and TRVE in Denver also fit the bill through the use of imagery and iconography. The folks behind TRVE are self-proclaimed “style blasphemers and category agnostics,” reminding fans of both metal and stellar beer not to take things too seriously and to embrace the chaos. 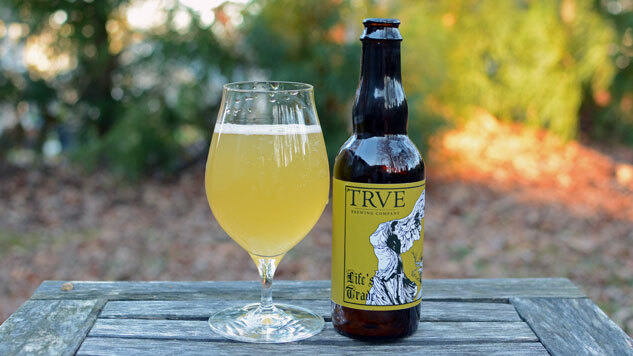 TRVE’s oak-fermented Farmhouse Ale, Life’s Trade, pours a hazy golden yellow with almost no head. What little bit there is fades quickly to a thin white ring around the outside of the glass. The nose of this mixed culture Saison is loaded with earthy farmhouse funk and you can pick up a slight bit of tartness in the aroma. There’s also a hint of the hoppy nose that’s common to New England IPAs. As I would find out, this definitely isn’t a hoppy beer, but a trace of that trademark smell is here for me. This Farmhouse Ale is a light and easy drinking beer. There’s a lot of flavor in the 4.7% brew, with a really nice tartness that follows the nose. It’s not overly sour by any means. It’s more like a perfect blend of a Sour Ale and a Saison. I can still pick up some of that earthy Saison character on my palette and the flavors are balanced enough to not overwhelm you. TRVE notes that this beer is fermented in wine puncheons with a variety of yeast strains before blending and bottling. You can definitely pick up on some of the wine character in the flavor as well as subtle lemon, citrus and funky mango flavors as the beer warms. I can see myself enjoying Life’s Trade on a warm summer day when a beer that isn’t too heavy or overly malty is the perfect option. The tartness here is something I typically long for in warm weather when I need a break from IPA and other hoppy styles. I tend to enjoy these tart Saisons and Farmhouse Ales with a little charcuterie and cheese, something with a little spice and nuttiness goes well with a beer like this. And meat and cheese are solid options to pair with a beer like this any time of year. Thankfully TRVE now distributes to my home state of North Carolina, so when spring rolls around, I won’t have to look too hard to find the brewery’s beers.